Heaven Hill Distilleries, Inc. tells BourbonBlog.com that September 2013 opening of The Evan Williams Bourbon Experience. 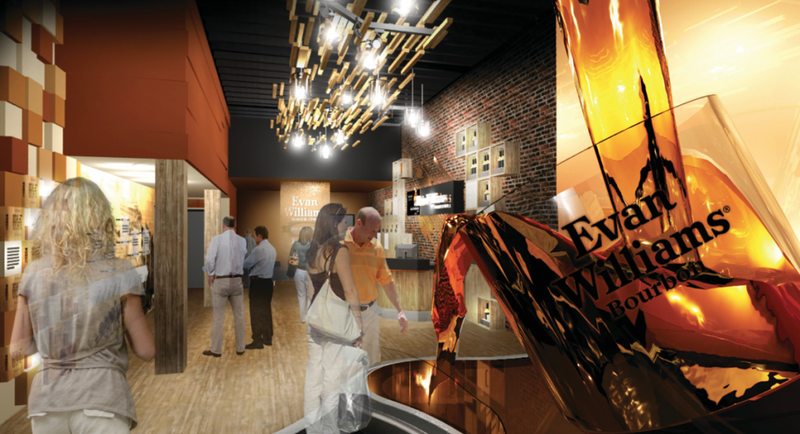 The Evan Williams Bourbon Experience™ will be a multi-million dollar artisanal distillery, immersive tourism experience and retail location which will celebrate the legacy of Evan Williams, Kentucky’s first distiller and namesake of Heaven Hill’s flagship Bourbon brand. Heaven Hill Distilleries will be renovating their historic building at 528 West Main Street, in the heart of what was once called “Whiskey Row” in Louisville. Evan Williams, who also served as an early Trustee of the City of Louisville, served as wharfmaster, and built the first county clerk’s office and city jail, set up his early distillery in 1783 near what is now 6th and Main Streets in downtown Louisville—almost directly across Main Street from where the new attraction will be located. The highlight of The Evan Williams Bourbon Experiencs will be a fully functioning, artisanal pot still distillery, viewable to visitors and capable of producing a range of American Whiskey types and styles. “It will be like a microdisitllery in there,” Heaven Hill Master Distiller Craig Beam tells BourbonBlog.com. “For now the plan is to simply Evan Williams in this small, working distillery. We’re brining back some history and teaching guests how Evan Williams is made at the same time. The gleaming copper pot stills are a modern version of the same type of equipment Evan Williams himself set up in his distillery along the Ohio River over 200 years ago. 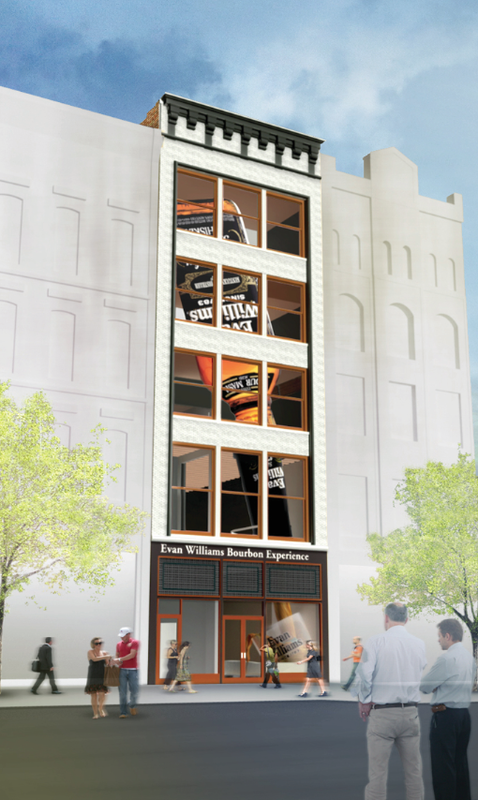 The Evan Williams Bourbon Experience will immerse guests in tours taking them back to Evan Williams’ original distillery, Louisville wharf scenes and high definition video renderings of turn-of-the-century Whiskey Row. 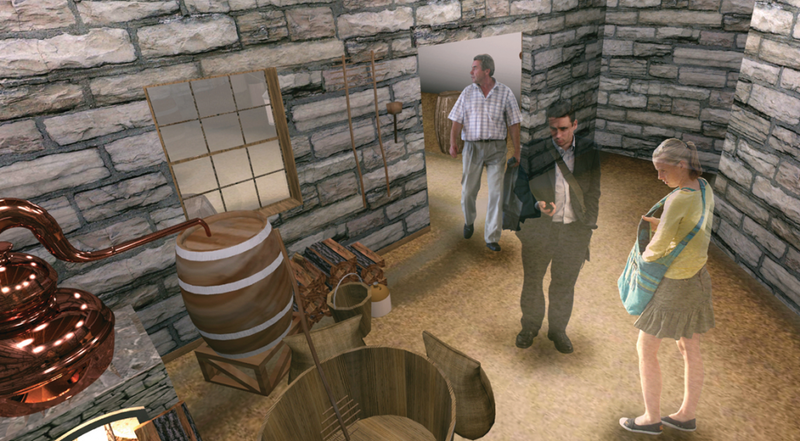 A dioramic video wall display allows guests to see how Heaven Hill’s modern Bernheim Distillery operates and how it is different from those in Evan Williams’ era, and then visitors will get to see a combination of the two—a state-of-the-art modern distillery using the same types of pot stills used in early Bourbon-making days. Displays on warehouses and aging will also be included, and guests of legal drinking age will have the opportunity to enjoy a tutored tasting of premium Bourbons in two different themed tasting rooms. One of these tasting rooms will be modeled after the interior of the Philip Hollenbach Co. Whiskey Distributor that occupied the building prior to Heaven Hill’s acquisition over 70 years ago. A large retail area will offer a range of Evan Williams branded merchandise, specialty food products, and a number of Heaven Hill’s premium Bourbons and American Whiskeys for sale. A “speakeasy” themed event space in the lower level will be available for corporate use, as well as public rental for special functions. Heaven Hill Distilleries says they expect the Evan Williams Bourbon Experience to attract in excess of 100,000 visitors annually, and to generate a significant amount of state and local tax revenue, as well as creating 14 new full time and nine part time jobs at the attraction. “This is a great project, not only because of Heaven Hill’s significant investment and the jobs it will create, but for the history that is being reclaimed as the bourbon industry returns to Main Street in downtown Louisville,” said Louisville Mayor Greg Fischer. Heaven Hill has operated its Bourbon Heritage Center in Bardstown as part of the Kentucky Bourbon Trail attraction since 2004. Drawing over 70,000 visitors annually, it is the most visited attraction in Nelson County.